VATICAN CITY (AP) — Pope Francis on Sunday gave his new cardinals what amounted to a code of conduct : "no intrigue, gossip, power pacts, favoritism." Francis also urged the 19 men he elevated to cardinal a day earlier to avoid behaving as if they were in a royal court. During his homily in St. Peter's Basilica, Francis told the cardinals to strive to "be saints." To achieve that, he advised them to simply love those who are hostile to them, bless those who speak badly of them, and "smile at those who perhaps don't merit it." Advocating humility, Francis is trying to reform a church hierarchy that has been criticized as arrogant, egotistical, petty and nasty. Scandals involving alleged corruption and power plays tainted the Vatican's top bureaucracy in the last few years before Francis was elected in March. As his papacy draws near the one-year mark, Francis has been drawing huge crowds for the traditional Sunday noontime appearance from a window of the Apostolic Palace overlooking the square. On Sunday, a breezy, cool day, the vast square was packed with tens of thousands of people. That is about two or three times the size of the crowds that his predecessor, Benedict XVI, usually drew on similar occasions. 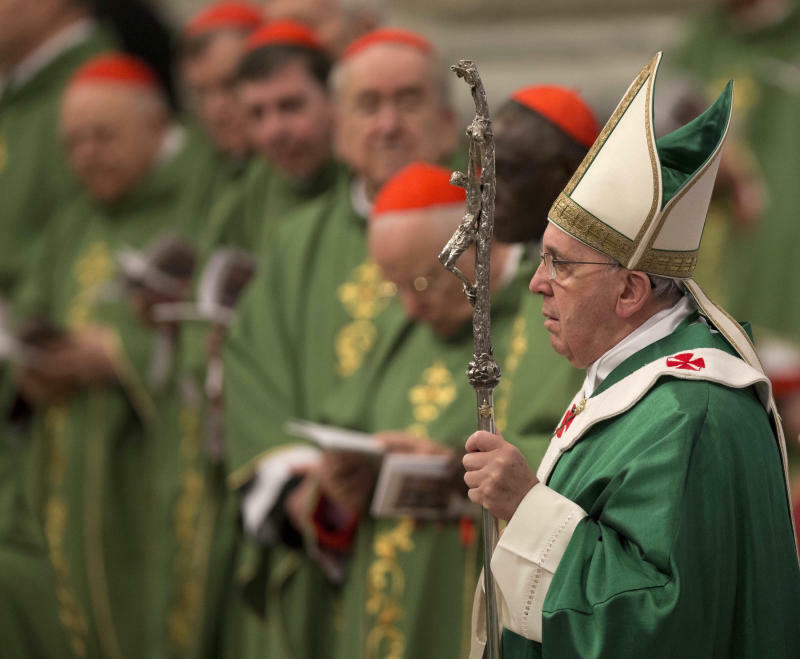 During the Mass for the new cardinals, Francis urged churchmen to keep their priorities straight, saying Jesus didn't die on a cross "to teach us drawing room manners."